- Is the suit jacket too long? I'm 5 foot 7 and I think my torso and arms are relatively longer than my legs so I was thinking that maybe my jacket length should be closer to mid crotch? Should I ask for it to be shortened by 1 inch? - Are the jacket sleeves also a bit too long? I was thinking of shortening it by 1/4 inch? - How do the shoulders look? Are they a bit too broad and padded? 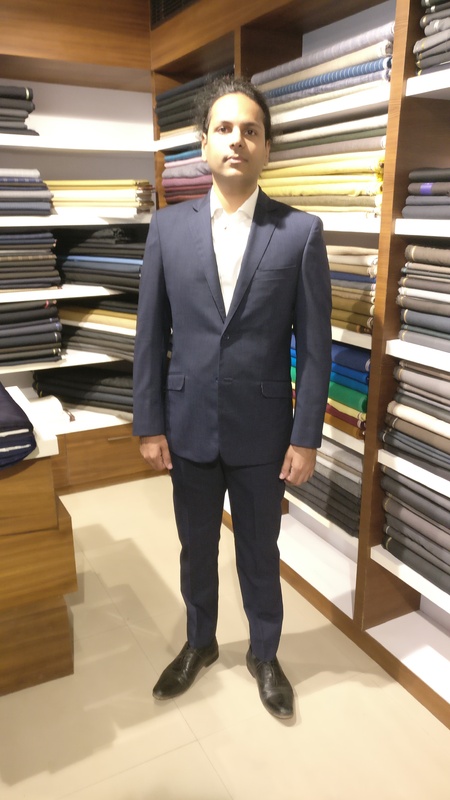 Should the lapel widths be wider to match the shoulder? - Are the trousers looking disproportionately slim, should they be widened? I realize I can't change some of these things but I want to know for my next suit. Any other comments? Edited by coldfire3k3, 29 January 2017 - 03:54 PM. Thank you for the reply Der Zuschneider. Yes I'll ask to get the sleeves shortened a bit I think. Regarding the fabric why do you feel it's terrible? Do you think it looks a little rough? I've added a few more photos. I chose it because it's 100% worsted wool, Super 100 (I thought a Super 100 would be more durable and last longer). The fabric is from Huddersfield fine worsteds ( http://www.hfwltd.com ). Edited by coldfire3k3, 29 January 2017 - 04:05 PM. I wouldn't shorten the jacket at all unless you're looking for a 'fashion' look. As to the lapels that's a matter of taste but it's too late to alter them. As to sleeves, where are your cuffs? I.e. have you pulled them down and seen where they lie? Edited by lngn2, 01 February 2017 - 07:20 AM. Leave the sleeve length like it is. You not doing any good altering them. It might be the angle of the picture but it looks as if the hem is lifting at the front: did you angle the hem line from the side seam to the front? There is a problem with your left arm, either not put in correctly or there is a cutting issue. Edited by tombennett, 02 February 2017 - 07:16 PM. I'm not a tailor, but the back photos show lots of drag lines, both in the coat and the trousers. I would be interested in what the tailors say. I would suggest not to have your pants made there. This tailor clearly made two straight tubes for the legs and did not bother taking your morphology into account. There should be some shaping below you bottom and the cut should be modified and shaping added at the knees and calves. 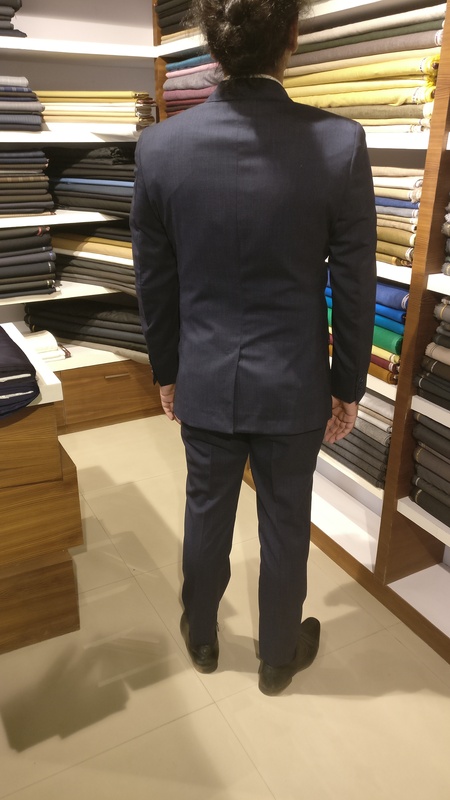 Finally, the length is a bit short on the back, the socks should not be visible (except if this is a style you wanted). Consequently, the hem should be slanted and not horizontal and the front of the hem should be iron shaped to transition nicely on the shoes. It would give more continuity to your legs and thus lengthen your silhouette (which is good at 5 feet 7). It's been quite some time since I have been on the forum. As I am retired I am busy with other things these days. I have popped on to see what is happening on the site and, chanced on this topic. If I might make a comment about your suit. What I see is, you have an erect stance. I don't know if it is the way you are posing for the picture but, it looks as if you need a little more front balance and a little less back balance. The longer back balance on the suit is causing it to fall on the hips, (which also seems to be a little on the tight side) and is causing the puckers in the hip and waist area. I would say your sleeves are a good length and, although the hang of the sleeve looks OK from the front. The back of the of the sleeves indicate they are pitched too far back, giving you the horizontal creases up the length of the sleeves. This could be your pose causing you to hold your arms back. On the other hand the course of this could be that the sleeves are too narrow. I would also say there are some pressing issues with vertical creases on front sleeves. 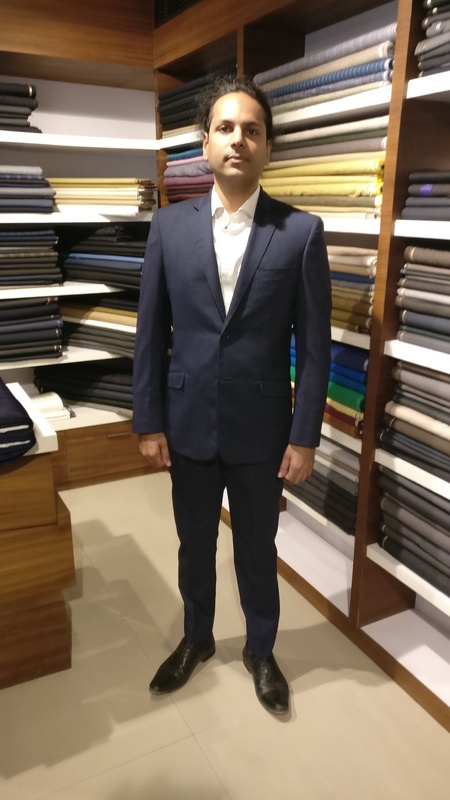 These are purely my observations, for you to discuss with your tailor for your next suit. They are not meant as criticism. I think that maybe the jacket is rather a tad too short and too tight around the waist. The pant is too tight and way too short and doesn't fit the shape of your legs. Observe all the lines under the arms and on the back on the picture from the back. Also the way the jacket is buttoned doesn't seem perfect, the upper button looks slanted. All in all, my impression is that the front of the jacket is too "flat" and the back too tight so it doesn't really flatter your frame. I think you are right about the lapels being too narrow. 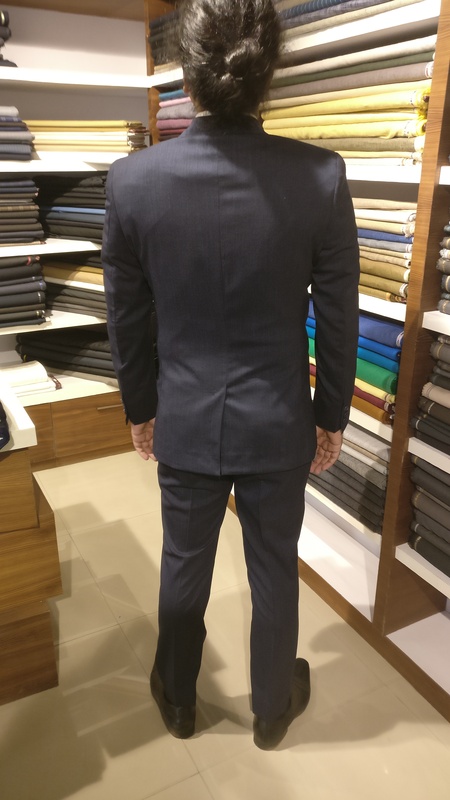 Search on Pintrest for "Perfect fitting men's suit" to find a style you like for yourself. Have a word with your tailor on all that, I sense that you aren't so happy about the suit as you ask for our opinion. Edited by Mammothy, 14 March 2017 - 07:57 PM. Is it possible that the shoulders are a bit too large? Or it is just the angle of photos?